Let’s Visit the Farm: On the Farm (Chagollan) – Joyce's mystery and fiction book reviews with some non-fiction too! This is an appealing book for young artists and their adults. 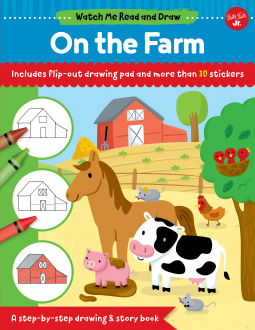 The book tells a simple story of a visit to the farm. This provides the opportunity to show all of the animals that are found there, along with barns, tractors, etc. Perfect for teaching young children the names of the animals and of course you can teach the sounds too. There is also a page showing how to draw the animals in simple steps. The back of the book has stickers and more space for creating artwork. All in all, an excellent activity book. Thanks to NetGalley and the publisher. All opinions are my own.